The day was marked by exceptionaly high volatility and massive fund flows away from risky assets. The dollar and the yen strengthened over Wednesday’s session as global investors continued to digest the ramifications of the events in China. The benchmark US dollar index rose by 1.17% – its biggest one day gain in over three months. The main losers were the euro and British sterling. 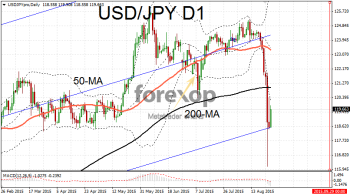 Both were heavily beaten down in Asian trade as risk aversion kicked in and traders turned to the relative stability of yen and the US dollar. The VIX (global volatility index) is spiking up to levels not seen since the Euro crisis in 2011. The greenback held its ground against the yen on Wednesday helped by some robust economic data (see below). 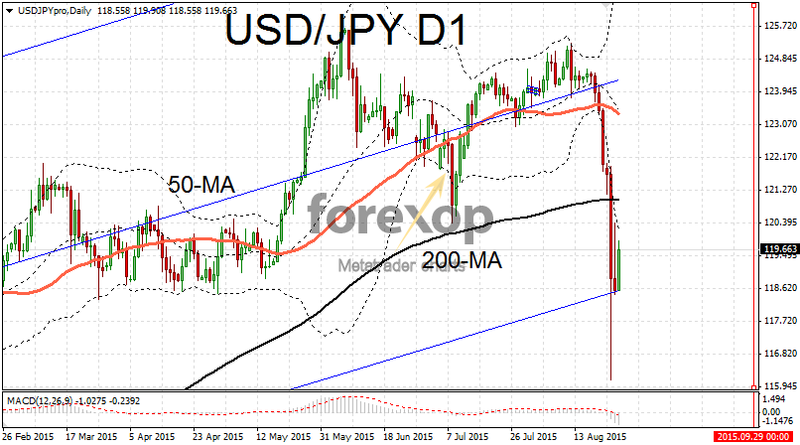 After six days of sharp falls USD/JPY rebounded to 119.61. However in a bearish pattern then pair has been trading beneath the 200-day moving average – an event last seen at the end of 2014. The dollar rallied on both sterling and euro taking back the recent highs both GBP/USD and EUR/USD had reached. Helping the US dollar were some decent economic reports. The durable goods orders for July came in much stronger than expected according to the latest figures from the Commerce Department. The durable goods orders – those for longer lasting manufactured items – increased by 2 percent in July. Core durable goods, the breakdown which excludes the highly volatile transportation category rose by 0.6% over the same period. The non defense capital goods category – seen as a proxy for business investment – also jumped which added to the upbeat assessment. The data cheered the markets after analysts had predicted a slight drop in orders for July of 0.4 percent. Crude oil supplies fell by a record amount last week according to the EIA’s regular update report. Supplies fell by 5.4M barrels to 21 August – a much bigger fall than had been predicted. Oil analysts had forecast supplies to drop by as little as 1M barrels on the week. Crude oil futures were trading on more “worrying cues” from China however and the report, which would usually be bullish, had little overall impact.